When it comes to interior design, tips are always welcomed. The video below from Bernard Katz Glass offers some practical interior design tips on a common question. This question comes up frequently. Sometimes the concern is because the glass sculpture or vase will be located in a public space. Sometimes the artwork is near a high-traffic area in a home or business… And sometimes your pets don’t realize how much you love your glass sculpture, or glass vase. In the video below, Katie Katz demonstrates how to use poster putty and similar products to help keep glass art from tipping over. 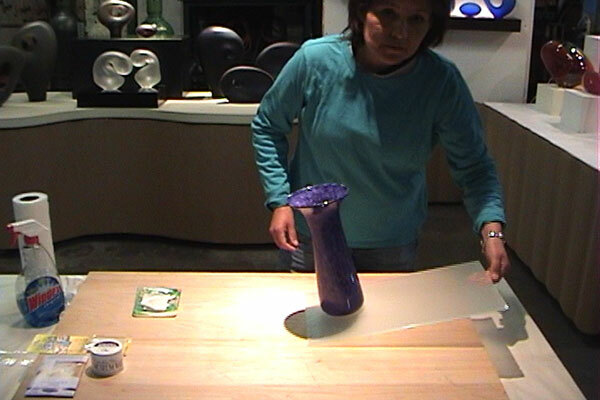 Katie shows how effective proper anchoring of your art glass can be. She also describes the various products you can use. Poster Putty – Sometimes called “earthquake” putty, is easily found at almost any hardware store and other retailers. Brands vary and some may be better than others. Museum Wax, Museum Putty, and Museum Gel – These are considered to be the best products and are worth a look. Each has specific applications depending on your needs. This link will give more information about each of these products – Museum Wax, Putty, and Gel. Anchoring artwork and collectables works best on a dust and grease-free non-porous surface. It is always recommended to do a test to make sure that the “hold” is good and marking or staining doesn’t occur. We hope you find this information helpful! If there are any other Interior design tips that you would be interested in having us cover, please contact us with your ideas.